Home brewing provides the opportunity to pull inspiration from just about anywhere. with the Afro Six-Nine took that inspiration from the movie Fletch. The follow up beer to Fat Sam, with the Afro Six-Nine once again takes inspiration from Fletch; a movie that would be on my list of movies I would need to survive being stranded on an island. Rather than taking a character, this beer takes a scene from the movie that just sticks with me; some may not even find it funny. It doesn’t really add to the overall movie but captures the main character day dreaming. It reminds me of the countless ridiculous circumstances my mind places me in. 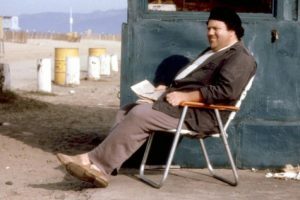 And, yes, I like Fletch 2 as well and was hoping the rumors that came out a few years ago about a remake with Ed Helms were going to be true. Alas, my daydreaming can only hope. 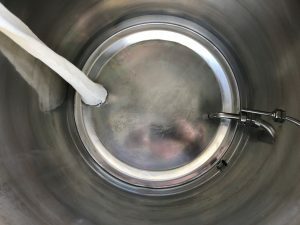 Changing the timing of the dry hop addition. 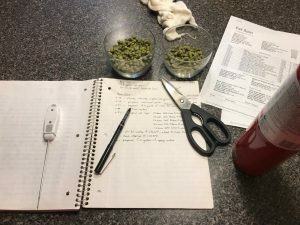 Lack of Focus was a NEIPA that I home brewed back in October. Due to time constraints, and quite possibly laziness, I never cold crashed the beer. It had the largest dry hop by weight I had ever done in a NEIPA. I was trying to achieve muckiness, it was supreme muckiness. In order to get said muckiness, I am changing the dry hop timing by placing it at high krausen. My thinking is this should bond the hops more as they seem to fall out a bit quickly. Looking forward to this beer. I do have one hesitation: potentially the lack of tropical fruit in the hops. Enjoy! 2018-01-01: @63.5*F, slow fermentation. Added blankets to trap fermentation heat. 2018-01-02 (morning): @71.7*F, hard fermentation. Removed blanket. 2018-01-02 (evening): @68.1*F, good fermentation. Added dry hops. 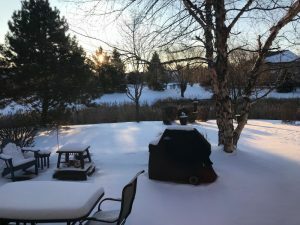 Put on heat at 69.0*F.
2018-01-05: cold crashed at 37.0*F.
Useless Fact: A typical pencil can draw a line that is 35 miles long. Fat Sam – the inspiration for this beer. Fat Sam NEIPA is yet another North East India Pale Ale (NEIPA). Are you tired of them yet? I am not. My senses love the hops. I think I may have finally found a winner. The combination of Mosiac, Citra and Rakau hops are ridiculous. There is good sweetness to this beer that brings me into the NEIPA territory. I have had multiple today and I looking for my third! 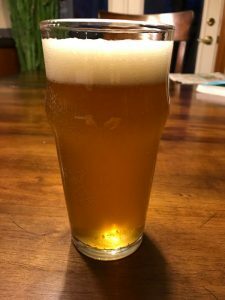 Look: Typical NEIPA that I have been brewing over the past year: brilliant, light gold color. Hazy. Big white foam. Slightly rocky as it begins to recede. Great retention and sticky lace. Aroma: The hops are huge here! Ripe tropical fruits: mango, pineapple, and papaya as well as stone fruits: apricot and peach. Nice balancing sweetness. Taste: The cornucopia of hops continues: mango, papaya and apricot are strongest, lingering. There is a bigger sweetness than I have had in more recent NEIPA attempts. Minimal to no bitterness. Body: Medium body. Medium/light carbonation. Crisp but not overly dry. Overall: This beer blows away She Doesn’t Sweat Much for a Fat Girl in every sense. The best NEIPA I have brewed. No question! Easy to drink. Mild enough on the senses to have multiple. Alcohol starts to sneak. I have been searching for that crazy hop profile for my person NEIPA on high. I have finally achieved it. I could have left it at Mosiac and Citra but I think the Rakau mingles and plays like a pro with those other two big boys. 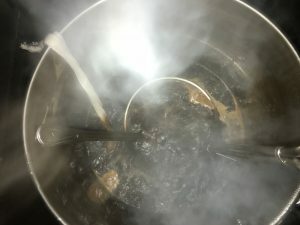 I have already looked into picking up more hops to allow further brew days but, unfortunately, it looks like Farmhouse Brew Supply is out of them. Enjoy! Useless Fact: In 2007, the CIA released documents that revealed the agency’s collaboration with the italian mafia in a failed 1960 attempt to assassinate Fidel Castro. Scratch built shelves to house all my home brewing supplies. 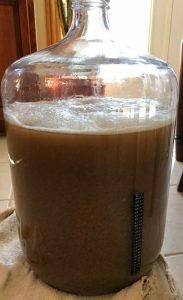 I have been home brewing for ten years, give or take. It has been a wild ride. 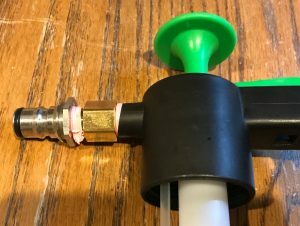 During that time I have tried many techniques, some fads and some that have built the foundation of how I continue to home brew. Some of the techniques that I tried needed new equipment or adjustments to equipment that I already had on hand. Nonetheless, the accumulation of supplies had taken up a good portion of one basement corner. Everything was neatly on the floor but, due to size, the sheer amount of square footage eaten up was ridiculous, besides, it still looked messy. A thorn in my eye. Get everything off the floor. We have had water seepage in the past. Give us back some room in the basement. We need more room for ball handling drills. Turn the neat messiness into just neatness. The shelves were inspired by shelves a friend had built in his basement to store all of his wife’s stuff. The unit would allow my grain storage, which on wheels, to easily slide in and out on the bottom while the plastic container protects against water. 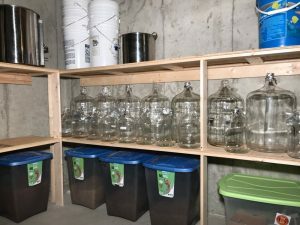 The upper shelves would allow for carboys, kegs, kettles, etc to fit together nicely. 2″ x 4″ – used to anchor the back part of each shelf to the wall. 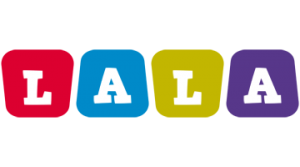 1″ x 4″ – used to create the horizontal structure for each shelf. 1/2″ plywood – for the shelf top, ripped to 18″ wide. 1″ drywall screws – secured the plywood. 2 1/2″ screws – secured all 1″ x 4″ pieces to each other via toe-nailing. I used all screws in order to allow for this to be taken apart. The 10′ shelf was on 24″ centers while the 4′ shelf was on 16″ centers. This was due to the fact of wanting to place bottled beer on the 4′ section. It is much sturdier. All legs were 24″ in height (this forced the kegs to a top shelf). After cleanup, it was time to load up all the supplies into their new homes. A few rearrangements later and I think I had a good configuration. There was the added bonus of ease of access to the supplies as well. Now I know I never need to purchase another carboy. Enjoy! Useless Fact: Louis Chevrolet, the founder of Chevrolet, died bankrupt and poor working as a mechanic for the company he started.